The Rural Affairs, Climate Change and Environment Committee (RACCE) of the Scottish Parliament published its Stage One Report on the general principles of the Land Reform (Scotland) Bill on 4th December. The plenary Stage One debate will take place in the Scottish Parliament on Wednesday 16th December. The Report is thoughtful and considered. I don’t agree with all its conclusions but it provides might food for thought during the Stage 2 deliberations when the Bill is scrutinised in detail and amendments considered. With the steadily growing interest in land reform, it is important at the outset to make clear that this Bill is not the sum total of land reform and cannot be expected of itself to deliver the kind of radical change that many are seeking. Further reform in land taxation, inheritance law, housing tenure and compulsory purchase are all being progressed separately. In addition, the demand to make the Bill more radical is constrained. Generally speaking, it is difficult to add a lot of new provisions to a bill as it is going through parliament. Having said that by way of preamble, what of the Committee’s report? In this blog I highlight some of the points that strike me as interesting and explain why, in one part of the Bill, the Committee has come to very mis-informed conclusions. As more and more people and organisations engage with the fundamentals of land reform (changing the legal, fiscal and governance framework for how land rights are defined, distributed and exercised), a range of refreshing perspectives is emerging. Two of these relate to inequalities and human rights. NHS Scotland submitted valuable evidence on health inequalities and how land reform can both help to overcome some of these but can also be exacerbated if existing patterns or inequality are not confronted. Similar observations were made by Professor Annette Hastings during the passage of the Community Empowerment (Scotland) Act. The Committee makes important recommendations (90-93) on this topic which will help to ensure that equalities become a core part of land reform in the decades ahead. Human rights is also an area that has received significantly more attention in relation to land rights in recent years. Community Land Scotland provided valuable focus on this in its Bunchrew Declaration from 2014 which highlighted the range of human rights issues associated with land reform. These go far beyond the traditional and rather narrow concerns of the protection of property rights in Article 1 of Protocol 1 of the European Convention on Human Rights (ECHR) which is embedded in the Scotland Act 1998. This paper by Megan McInnes and Kirsteen Shields elaborates this point. It is often overlooked that the observance and implementation of all international human rights instruments (indeed all international treaty obligations) that relate to devolved matters are within the competence of the Scottish Parliament (1). Recommendations 121 and 122 helpfully address this important point. Parts 1 and 2 of the Bill deal with the Land Rights and Responsibilities Statement and the Scottish Land Commission. Here, RACCE make some sensible recommendations that will clarify and improve the proposals in the Bill. 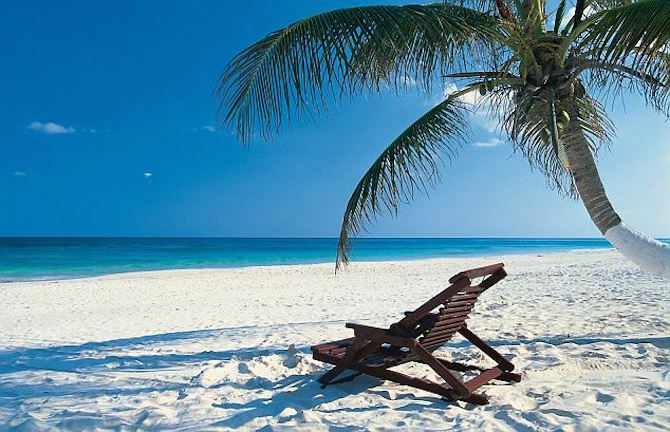 Part 3 deals with transparency of information about who owns land and, in particular the proposal originally contained in the December 2014 consultation that any owner of land in Scotland that was a legal vehicle such as a company or a trust should be registered in a member state of the EU. 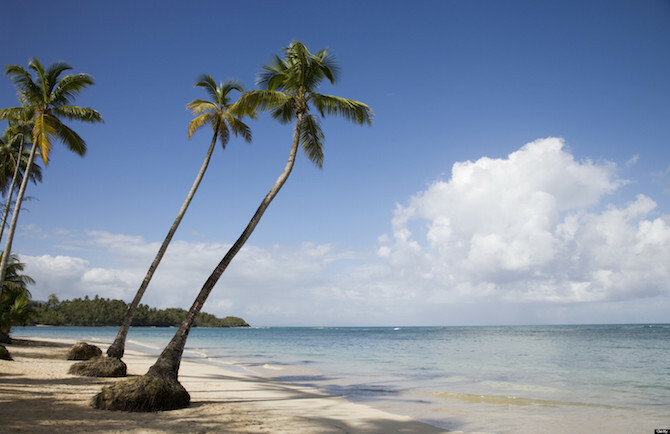 This proposal would end the ownership of land registered in tax havens such as Grand Cayman and Panama. The Scottish Government has been very resistant (see here) to proceeding with this reform but the Committee recommends that it be looked at again and that it be applied retrospectively (thus existing non-EU entities would have to comply within a defined period of time). This is very welcome and should open up this important issue to further scrutiny. Parts 4 and 5 on engagement with communities and the right to buy land for sustainable development. Again, the Committee’s recommendations are measured and helpful in improving the detail of how these provisions will will work in practice. Part 6 is one of the simplest and straightforward reforms in the Bill – the removal of the 1994 exemption from non-domestic rates (NDR) granted to shootings and deer forests. Here, the Committee has expressed strong criticism of the proposal to end this exemption and made a number of recommendations. In broad terms, it is not convinced of the case for removing the exemption because of the potential impacts this might have. In coming to this conclusion, however, the Committee appears to have been seriously misinformed by the special pleading of those who stand to be affected by the proposal and to have relied solely on assertions made in evidence from landowners, shooting interests and gamekeepers, all of whom predicted impacts on rural jobs, economic and communities if the exemption was removed. Non-domestic rates are not a tax on businesses. They are a property tax – a tax on the occupation of land and property and based upon the rental value of of land and property. Many businesses of course occupy land and property but NDR is not a tax on their business (newspaper shop or factory). It is the capture of part of the rental value of the land and property they occupy. NDR is paid by many occupiers that are not businesses such as cricket clubs and secondary schools. 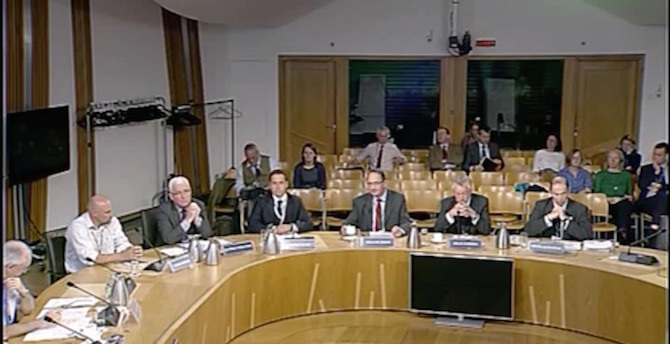 Even the Scottish Parliament pays NDR. The Committee seeks a thorough, robust and evidence-based analysis of the potential impacts of ending the sporting rates exemption (including what impact imposing the exemption had in 1995). There is little need for such an assessment for the simple reason that the impact of any reform of property taxation is well understood. By definition it has no impact on environmental matters (it is not an environmental tax) and no impact on social matters (it is not a welfare or employment tax). Of course, no-one likes have to pay tax especially if it is a tax that someone had gained an exemption from. But the special pleading made by landed interests is little more than a veiled threat that if the exemption is ended, those responsible for paying it will choose to do things that might have negative effects (reduce environmental management inputs or reduce employment). The tax itself has no such impacts and the potential impacts are straightforward to determine. The impact is succinctly described in the Mirrlees Report as follows (this is in relation to land value taxation but the impact is exactly the same for any tax on the occupation of land or property). When rates on shootings and deer forests were abolished in 1995, the impact then was straightforward. It resulted in a windfall gain for landowners either because their land rose in value as a consequence of the removal of the recurrent liability or they could extract more rent since the occupier (who paid the tax) was relieved of the liability and thus able to afford a higher rent whilst being no worse overall (the new rent equalled the previous rent plus rates). Given that the Committee is not routinely involved in fiscal policy, it perhaps not surprising that it has swallowed the assertions of those whose evidence was based on a flawed understanding of property taxes. Over the past 20 years, the owners of shootings and deer forests have been granted an exemption from tax that has had to be paid for by increasing the burden on other non-domestic ratepayers. Over the course of two decades they have profited from this tax break. It is entirely reasonable when public finances are tight that such exemptions (which exist for no good reason) should be removed. The re-establishment of a local tax liability on land devoted to shooting and deer forests ends the indefensible abolition of this element of non-domestic rating by the Conservative Government in 1994. To most people, it might seem odd that, whilst the hair salon, village shop, pub and garage are subject to rating, deer forests and shootings pay nothing. 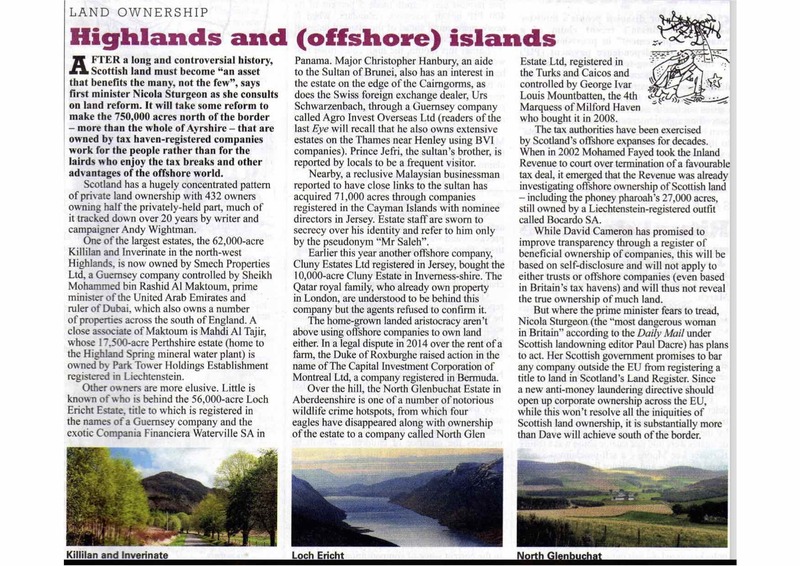 To take one example, the Killilan deer forest near Kyle of Lochalsh is owned by Smech Properties Ltd., a company registered in Guernsey which, in turn, is owned by Sheik Mohammed bin Rashid al Maktoum, the King of Dubai and Prime Minister of the United Arab Emirates. Killeen was included on the valuation roll in 1994 at a rateable value of £3500. By comparison, the local caravan site had a rateable value of £3100. Today, the caravan site has a rateable value of £26,250 and pays £12,127 per year in rates whilst one of the worldʼs richest men, whose land is held in a tax haven has (unlike the local caravan site) paid no local rates for twenty years on the land he uses for shooting. Why should caravan sites, pubs and local shops subsidise those who occupy shootings and deer forests? Non-domestic rates contribute to the revenue of local authorities used to pay for schools, roads, refuse collection, care homes, environmental and leisure provision and social care. “Sporting estates like to describe themselves, when it suits them as being part of a sporting industry. In fact they are part of an inefficient trade which pays inadequate attention to marketing their product, largely because profit is not the prime objective. “..local staff are poorly paid, their wages bearing no relation to the capital invested in the purchase price, and it is not unusual to find a man responsible for an investment in millions being paid a basic agricultural wage. Many of the estates use short-term labour during the sporting season, leaving the taxpayer to pay their staff from the dole for the rest of the year. Estates can in many cases be deliberately run at a loss, thereby reducing their owner’s tax liability to central funds elsewhere in the UK. Finally, the Committee is recommending analysing the impact of the exemption in 1995. Again, this is straightforward – the removal of the liability was capitalised into land values and resulted in windfall gains for existing owners. This was well understood at the time by landowners themselves. In a letter written to members of the Scottish Landowners Federation in April 1995, the President, informed them that abolition make a “great success” for the Federation “culminating many years of negotiation”. “Many members will be relieved of substantial expense”, he observed and then went on to appeal to members to donate some of the windfall gains to the Federation to contribute to a contingency reserve that would be used, among other things to fight new environmental constraints “being imposed on certain classes of land” which, as a result “must lose some of its capital value”. Members who were being “spared Sporting Rates” were invited to donate one third of their first year’s savings to the Federation. By June 1995, over £54,000 had been donated. It is not known if further appeals were launched. Therefore, as far as the impact of the exemption is concerned, the windfall gains ended up in landowners pockets and some of it was used to fund lobbying activity. The challenge for the Stage 1 debate is to address the observations made by RACCE and to clarify what further progress can be made to address them within this Bill. In addition, it is an opportunity to explore what outstanding issues (and there are many) might be addressed in the manifestos of the political parties for the 2016 Holyrood elections when Parliament will have a five year term to push ahead with further reform. (2) See Chapter 16 of Mirrlees Report.